It’s what every underground filmmaker dreams of. Heck, it’s what everybody who throws their videos up online dreams of! That their little mini-masterpiece will become a viral video sensation, embedded on mainstream news web sites and viewed by millions of people all over the globe. That’s exactly what happened to pop culture remix masters Wreck & Salvage, whose video Palin’s Breath — embedded above, of course — became even more popular than the video it was riffing off of. It became, in a day, a phenomenon. But, really, what goes into a viral hit? And do the makers of such media do it intentionally for the fame and the glory? Or, is it all just random? On Thursday, Jan. 13, Wreck & Salvage released an edited version of that video that cut together all of Palin’s breathing and lip-smacking moments to both Vimeo and YouTube. Within hours, the video was featured on major web sites such as Salon, Movieline and The Daily Beast. And that’s just what I could track. I don’t know how much the video was Facebooked, Tweeted, Reddited and shared in who knows what other ways. Since then, Wreck & Salvage’s video has received nearly a million views, which is way more than Palin’s original message. But who is Wreck & Salvage anyway? They’re a trio of supremely talented editors — Erik Nelson, Adam Quirk and Aaron Valdez — spread out across three different states who have been producing work under the W&S banner for five years. The three are known for taking pop culture detritus and remixing it into exceptionally entertaining ways. Prior to Palin’s Breath, the group was already what could be described pretty popular. Their Vimeo channel has — as of this writing — over 250 videos, over 1000 “likes” by viewers and over 550 contacts. On YouTube, their channel has over 650 subscribers and, prior to Palin’s Breath, their videos had been viewed collectively over 700,000 times. Underground Film Journal: What gave you the idea to edit the Palin video in the way you did, just focusing on her breaths? Wreck & Salvage: I think the thing that caught my eye first was the resolution (1920×1080) of the video she posted on Vimeo. It had huge play value. I made a few different cuts, and had dozens more videos farmed to add to it, but it just stayed this way. It was a quick chop, made in less than an hour, the best ones usually are. It’s also nothing new to focus on breaths, or removing words when you’re remixing video. UFJ: When you think about editing a new piece, are you thinking specifically about their potential viral quality? W&S: What is this viral quality you speak of? We’re in the business of making fungal video. UFJ: Were you thinking of making any kind of political statement with this, or was it just that this particular video had a political figure in it and lent itself to a good idea for an edit? W&S:I’m about as apolitical as they come. Left or right, everyone and everything is fair game for Fair Use. UFJ: A lot of W&S videos are political in nature, even if it’s just tangential. Are you guys political? Or does politics just give good visuals? W&S: We work with all existing media, and if we’re dealing with current culture/media, it’s only natural that politics enters into it. Politics is just theater anyway. UFJ: Is there an overall philosophy behind W&S? W&S: Raise Hell and put a block under it. Typical of the group, Nelson’s answers are on the cagey side, but still speak to the heart of the video. This isn’t a video about Palin specifically. It’s just that her performance lent itself to a great video. With those tightly pursed, admonishing lips lecturing the world as if she’s it’s uptight schoolmarm, it’s practically impossible not to focus exclusively on her odd breathing tics. Plus, another thing that’s genius about this video that you may not realize unless you look at the original and the edit side-by-side, is just how close Nelson has zoomed into Palin’s face, making her lip-smacking all the more uncomfortable. I’ve worked in online video for years. In addition to the Underground Film Journal, I’ve managed video libraries for major websites such as IFILM and Movies.com. At all of these jobs, I’ve had people clamoring to make a video that achieves stratospheric viral success like Palin’s Breath has. But, the hits are always a happy accident. A good viral video can’t be planned. Nelson produced this quickly and just on instinct. What truly goes into a hit viral video? Something that speaks to something that’s larger than itself. 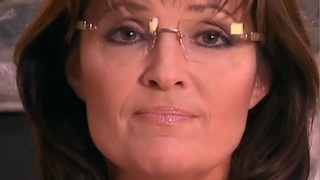 As I said, this video isn’t about Palin specifically, but it’s everything about her at the same time. And the video riffed on another video that people were already uncomfortable about, even though Nelson isn’t commenting on the whole controversy about Palin’s notorious “blood libel” comment in the original. Making a great viral video is about being keyed into everything and working intuitively. Plus, many of the mainstream websites that embedded Palin’s Breath don’t even bother to mention Wreck & Salvage’s involvement. Salon even gave the credit to the anonymous “Internet.” But, still, I hope the video brings even more attention to their great work. I’ve been fans of these guys for years and they deserve it. Bravo on bringing attention to both PALIN’S BREATH and the video’s creator, Wreck and Salvage. Your interview with Nelson is priceless. His responses remind me of an interview the NEW YORK TIMES published years ago with a Chinese political dissident who was under house arrest. His responses were 99.9 percent subtext. And hilarious. Thank you. I was actually expecting to get all more technical answers — like the first one — from Nelson, but was very happy that he didn’t go that route. The ability to make your video go viral nowadays seems like the equivalent to winning an Oscar or getting into a major festival. It’s something all us filmmakers hope to attain. But what I think helps getting your film or video to go viral is making it topical or reference something popular in our pop culture. Palin’s Breath is a definite example of that. Because of her recent spat on the news, everyone is clamoring for videos on her. And filmmakers who are clever and good at what they do can turn around something really quick and it will get a large number of hits. It doesn’t always have to be current events. A short film like Pixels can garner tons and tons of views because of its nostalgic content (8bit characters from vintage video games attacking NYC). I think it’s harder for a filmmaker to create a viral hit if it doesn’t contain something that the audience is familiar with. That being said Palin’s Breath is great. I was so uncomfortable watching it and felt like my ears were going to explode. And I mean that as a compliment. After that, I watched “Transition” which again overwhelmed me. The editing on their videos is so kinetic and I really appreciated his comment on how quickly it took to cut it together. ” It was a quick chop, made in less than an hour, the best ones usually are.” I agree with that completely. If the editing just comes naturally and quickly, it’s going to be a great piece. Sometimes prolonging the editing process just drains the project of all its magic.